LG are the third of the "big five" manufacturers to show off an Android handset with the LG GW620, following Motorola and Samsung, and meaning that only Sony Ericsson is left to is make an announcement.. Nokia is not playing the Android game and has its own path to follow with Maemo on the new N900. 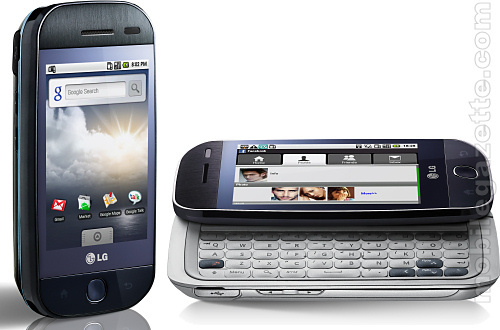 The LG GW620 looks rather like the Motorola CLIQ and very much like the LG GW520 which is handy, because LG haven't given out any specs for the GW620. We know that the GW620 has a 3" panel, our best guess is it shares the 240 x 400 pixel resolution of the GW520. It most likely comes with WiFi, HSDPA, a 3 or 5 megapixel camera and it probably weighs around 130 grams. We're not away of any Android phones without GPS, so it would be a safe bet to assume that the GW620 has it too. LG are keeping the full specification of the GW620 under their hats, presumably along with whatever name the phone is going to be marketed under. Strangely enough, LG have also gone to some lengths to point out that they still remain committed to producing Windows handsets, which is a little odd as we hadn't considered otherwise. From what we can see, the LG GW620 looks like it might be quite a decent Android handset. 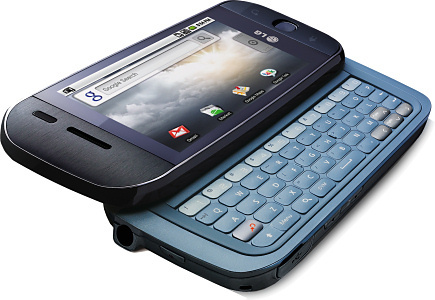 The relatively large screen and good looking QWERTY keyboard, combined with reasonably attractive looks may well be enough to attract customers when it comes out in Q4 2009. The GW620 was launched very late in 2009, and actually comes with a 3" 320 x 480 pixel display, 5 megapixel camera, WiFi, GPS, a stereo FM radio, weights 139 grams and runs Android 1.5. We have revised the "at a glance" box to reflect this. LG say that the GW620 will be called the "LG InTouch Max GW620" in the UK, and will be available on Virgin Mobile and T-Mobile, more details can be found here.